"Nikon will have a press conference regarding new camera products and their strategy on February 23." Here is the original source in Japanese. I have used this site as a source before on PhotoRumors and they have been accurate in the past. 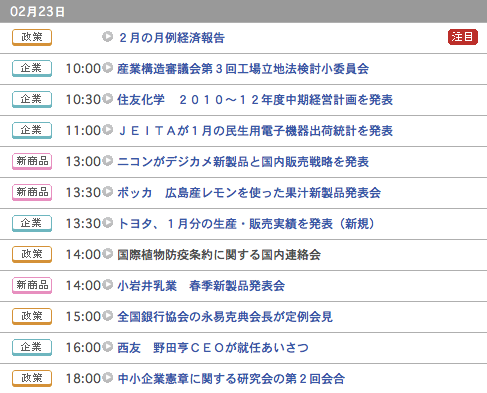 This will be the first time Nikon will have three press conferences in a row. The Nikkor 24-120 f/4 VR lens rumor said that it will be coming "soon". They could be another lens in addition to the Nikkor 24-120 f/4 VR. This press conference will be different - maybe they will just announce that they are working on a new product line. Update: I think this page has also some info on the upcoming Canon and Sony press conferences. Can someone translate please? Thanks! That "strategy" seems to be specific at "domestic (Japan) selling strategy". And they use "デジカメ新製品"(digital camera new products). In Japanese, デジカメ usually refers to "digital (point-and-shoot) camera". So cannot be certain whether Nikon will announce new DSLR... And, no Canon or Sony mentioned. Maybe they will announce plans for the Nikon EVIL system (see previous Nikon EVIL rumors here). Nikon will "announce" new digital camera and selling strategy inside Japan. However, I should say the word "announce" in Japanese may have another meaning = "talk". Therefore, it could be: Nikon just "talk" about their new digital cameras (that means the Coolpix just launched in PMA) and also the selling strategy inside Japan as well. This word is too ambiguous so I think it may not be firm enough to conclude a completely brand new Nikon digital camera will be announced on 23th Feb 2010. This entry was posted in Nikon 1, Nikon D800 and tagged Nikon press conference. Bookmark the permalink. Trackbacks are closed, but you can post a comment.